David Lewis ’11 spent his summer banding birds, surveying plants and plovers, and teaching children about macroinvertebrates at the San Francisco Bay National Wildlife Refuge. An environmental science major from Fredericksburg, Va., David said the experience solidified his love of the outdoors and the need to protect the natural world. His favorite part of the internships was working with the other five interns. “They were a motivated group and worked really hard,” he said. David said his love of the nature was sparked when he volunteered for a 25-day trail building school at Yellowstone National Park when he was a senior in high school. Subsequent summers found him working as an administrative intern for the Environmental Protection Agency in Washington, D.C., and spending a week in Alaska as an administrative aide to the regional director of the National Wildlife Refuge system. He attended a bear safety training course and got to take a float trip down the Kenai River. A member of Sigma Phi Epsilon, David has kept busy with service projects and intramurals during his time at LC. He hopes to get involved in a new organization, Hillel: The Foundation for Jewish Campus Life, starting this year. 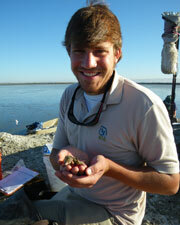 After he graduates, David hopes to continue working at wildlife refuges for a while. Eventually he hopes to be involved in big-picture environmental policy.